In 2006, one of the hottest years on record, a “pizzly” was discovered near the top of the world. Half polar bear, half grizzly, this never-before-seen animal might be dismissed as a fluke of nature. Anthony Barnosky instead sees it as a harbinger of things to come. 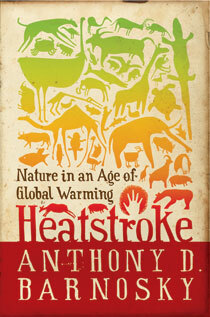 In Heatstroke, the renowned paleoecologist shows how global warming is fundamentally changing the natural world and its creatures. While melting ice may have helped produce the pizzly, climate change is more likely to wipe out species than to create them. Plants and animals that have followed the same rhythms for millennia are suddenly being confronted with a world they’re unprepared for—and adaptation usually isn’t an option. This is not the first time climate change has dramatically transformed Earth. Barnosky draws connections between the coming centuries and the end of the last ice age, when mass extinctions swept the planet. The differences now are that climate change is faster and hotter than past changes, and for the first time humanity is driving it. Which means this time we can work to stop it. No one knows exactly what nature will come to look like in this new age of global warming. But Heatstroke gives us a haunting portrait of what we stand to lose and the vitality of what can be saved. "[Barnosky]… argues brilliantly that conservation biology can no longer focus on saving [ecosystems]. The reason is simple: Thanks to global warming, the ecosystem we work to save today will have a different climate tomorrow." "Lucid and thought-provoking popular account of climate change and biodiversity, past and present...an essential contribution...[and] a deep-history tapestry of life and evolution that is infused with admiration, curiosity, and respect for the grand experiments of nature." "Read this book, and reflect on your own views about humanity's place in nature. Then plant a tree, walk to work, and go and call your political representative." "Barnosky is less gloomy than curious, able and straight-forward, flavoring his report with a sense of adventure and possibility; by the end of his discussion on humanity's four-pronged problem—global warming, habitat loss, introduced species and population growth—Barnosky will have readers looking to do more than change lightbulbs." "Easily accessible yet thoroughly referenced work...This work is laced with fascinating descriptions of colorful people and places that make it enjoyable to read, even if the topic is sobering...Highly recommended." "Barnosky uses a unique approach to address the problem of global warming… Rather than dwell on human factors, he offers a host of examples from the past to illustrate how animals of previous era survived or failed to adapt… In straightforward language, this sensible climate-change book presents solid evidence from earth's deep history." "This fascinating and frightening book begins where others on global warming leave off. Anthony Barnosky shows that we're not just heating up the planet, but changing its basic character: today's familiar animals and wild places may not be here tomorrow. For anyone who has grown attached to nature as we know it, this is an essential, eye-opening read." "Heatstroke is an important and useful addition to the library on climate change, bringing insights from deep-time ecological research to help illuminate the dire forecasts of which we're already so aware." David Quammen, author of "The Song of the Dodo" and "The Reluctant Mr. Darwin"
PART I. Recipe for Disaster?